Villa Coral is unique and distinctive architectural masterpiece. 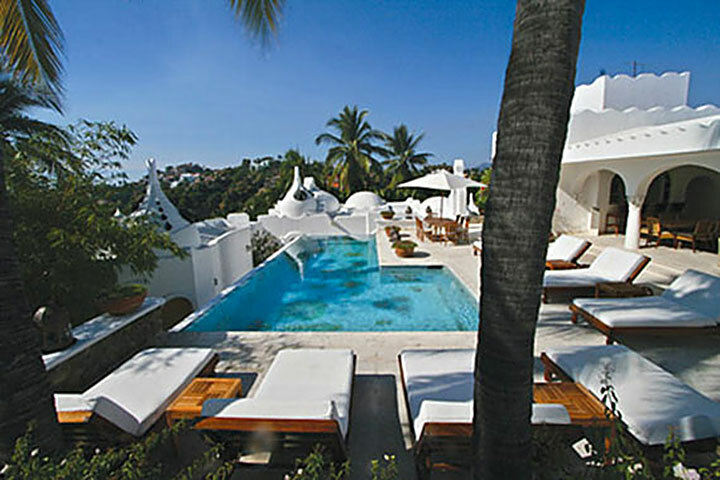 Designed by famed architect, Jose Luis Ezquerra, and located within the exclusive gated community of La Punta in Manzanillo, the villa awaits discerning guests seeking the "Lifestyles of the Rich and Famous" as this Villa was depicted by the renowned Robin Leach. As a backdrop to this exquisite home is a view from its hilltop location of historic Hotel Las Hadas, the locale for the notable movie "10" starring Bo Derek and Dudley Moore. This magnificent luxury Villa, the premier residence of La Punta, is bathed in morning and afternoon tropical sun, and it features a central entertainment area with large infinity pool; ample bar, kitchen, dining, and lounging facilities; plus a lovely enclosed air conditioned salon that includes television and other viewing equipment, various music players, and business center. In addition, guests may savor the pleasure of the privacy and comfort of anyone of the six generous sized segregated and individual suites, each with a private patio. The terrace for the master suite also contains a sizable type plunge pool/ Jacuzzi. As part of La Punta, the secure and well managed gated community of this magnificent estate, guests also may wish to frolic and play at the serene exclusive private beach and beautiful beach club facilities, tennis courts and tennis pavilion, or other well manicured and landscaped green and common areas. Although VILLA CORAL and its gated community are cloistered with complete privacy and exclusivity, there still exists within five to ten minutes of this special residence every possible additional amenity and convenience necessary for both holiday enjoyment as well as the vital essentials found in larger population centers. For example, there are three championship golf courses ranging in driving time from the Villa gates of five to sixty minutes; a marina minutes away with world class fishing and boating opportunities; gourmet restaurants, all kinds of night life activity, and major hotels nearby; and eco-adventure and other unusual tourism attractions and destinations within reasonable distance. For life's everyday necessary conveniences, there are medical clinics; hospitals; pharmacies; banks; cinema; supermarkets; and all other types of shopping availabilities within minutes of the residence as well as an international airport approximately 35 minutes away. House calls easily can be arranged for doctors as well as massage, pedicure, manicure, and other specialists. And, of course, this unique and unusual palatial Villa is fully staffed with cheerful people to serve all your needs including a chef who will attend to your every taste, palate, and dietary requirement. Villa amenities also include a vehicle, mopeds, bicycles, kayaks, golf clubs, tennis rackets, satellite TV, CD and DVD players, ipod docks, outdoor grill, free international phone system, internet, and unforgettable views for memorable photo opportunities. Daily maid service for you convenience daily. Summer minimum of 4 nites, winter minimum of 7 nites and holidays minimum of 10 nites. Rates are in US dollars and are subject to change without notice.